Southern junior Logan Drummer (center) pulls into second base as Waterford gets the ball in from right field, during the Tornadoes’ 9-3 victory on Wednesday in Racine, Ohio. RACINE, Ohio — The Tornadoes did something that no team had done in quite some time. 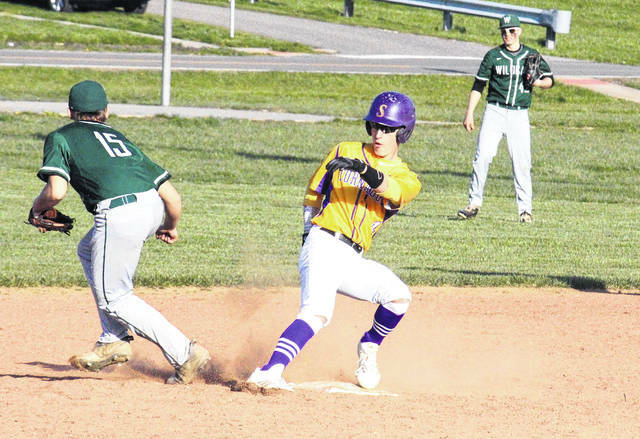 The Southern baseball team handed Waterford its first Tri-Valley Conference Hocking Division loss since 2016 on Wednesday at Star Mill Park, knocking off the defending league champs by a 9-3 count. The Wildcats manufactured a run in the first inning without the benefit of a hit, as Noah Huffman drawing a leadoff walk and ultimately breaking the scoreless tie. Southern (4-2, 4-2 TVC Hocking) answered in the bottom of the first, with Billy Harmon singling home Gage Shuler with two outs, tying the game at one. Still in the first, Coltin Parker doubled home Harmon and Dylan Smith to give the hosts a 3-1 lead. 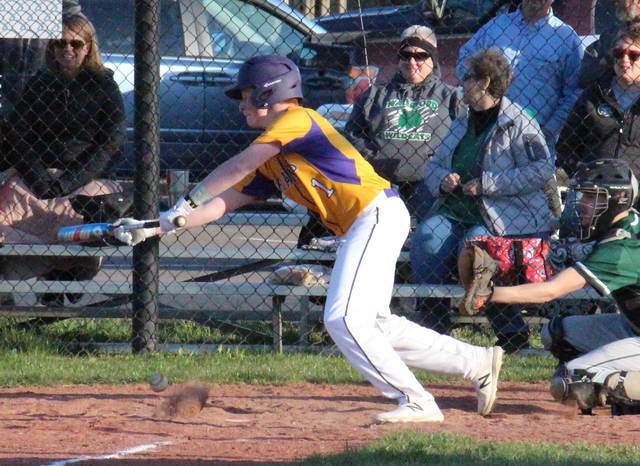 After a 1-2-3 top of the second, Ryan Acree and Logan Drummer both came around to score in the home half for the Tornadoes, making it a 5-1 game. 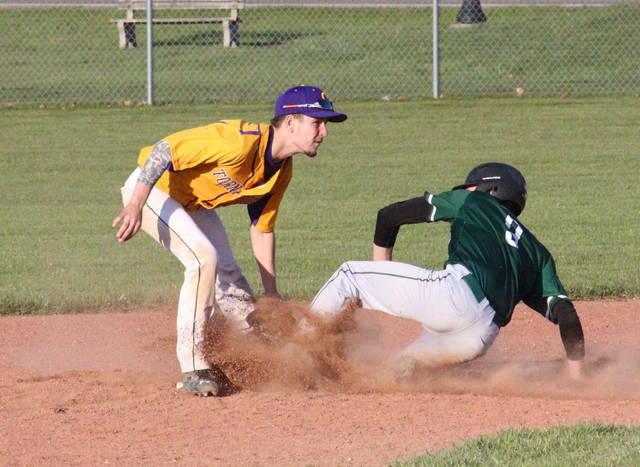 The Wildcats got a run back in the bottom of the frame, with Peyton Stephens scoring on a Bryce Hilverding double, but the guests were blanked in the next two frames. The Tornadoes were put away in order in the third inning, but Jensen Anderson singled home Drummer, and then scored on a double by Harmon, giving SHS a 7-2 lead in the fourth. Southern’s lead grew to 9-2 in the home half of the fifth, with Shuler singling home Logan Dunn, and then scoring on a single by Smith. The Wildcats pushed one run across in the top of the sixth, but couldn’t score again and fell by a 9-3 count. 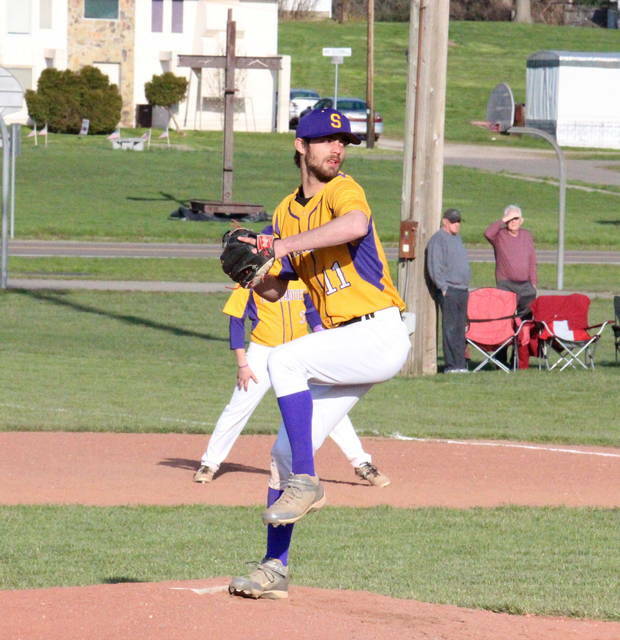 Smith earned a victory in a complete game for the Tornadoes, striking out 10 and allowing three runs on three hits, three walks and one hit batter. Isaac Wagner suffered the loss in the record book, pitching 1⅓ innings and allowing five runs on four hits, four walks and a hit batter. Harmon led the Purple and Gold at the plate, going 3-for-3 with a double, a run scored and three runs batted in. Shuler and Smith both went 2-for-3, with Shuler scoring twice and driving in one run, and Smith earning a run and an RBI. Anderson singled once, scored once and drove in two runs for SHS, while Parker singled once and drove in two runs. Drummer scored two runs in the win, while Dunn and Acree both scored once. Leading the Wildcats, Hilverding doubled once, scored once and drove in a run, while Huffman singled once and scored once. Waterford committed the game’s only error, and left four runners on base, while Southern stranded eight. These teams are scheduled to meet again on April 30 in Washington County. The Tornadoes are slated for non-league competition next, as they head to South Point for a twin-bill on Saturday.